Impart a fun and modern design into your living room with the Monroe collection of chairs and ottoman. 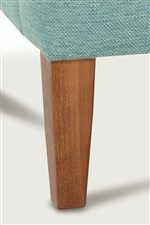 No matter what your existing decor is you can add these chairs by choosing an upholstery and wood finish that will match. Extra firm cushions will provide you with ample support and comfort that will last. 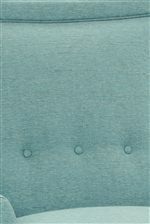 The unique three button tufting and welting details on the chair backs carry a contemporary style. This collection will make a great addition to any home and lifestyle. Browse other items in the Monroe collection from AHFA in the area.